There are only 2 more weeks to 25th December 2016, which means we are only 20 days away to Christmas! Hence, in today’s post, I want to share with you guys some marvelous Christmas decoration ideas that can bring magic throughout your house in this festive season. Whether you have a classic, traditional home or a contemporary home, I have compiled a wide array of Christmas decoration ideas that will definitely suit your holiday decoration needs. By playing around with non-traditional colorful ornaments, metallic accent Christmas decorations, pom-pom garlands, burlap stockings and candlesticks, you can achieve that unexpected result which will transform your home into a magical place full of Christmas spirit! Take a glimpse at these 6 special themed Christmas decorations which are all the rage this season and get inspired with us! Still thinking of adopting the traditional red, green and white ornaments to decorate your home? Add flairs to your Christmas decorations with jewel-tones Christmas decoration to brighten up every room of your house with whimsical colors! 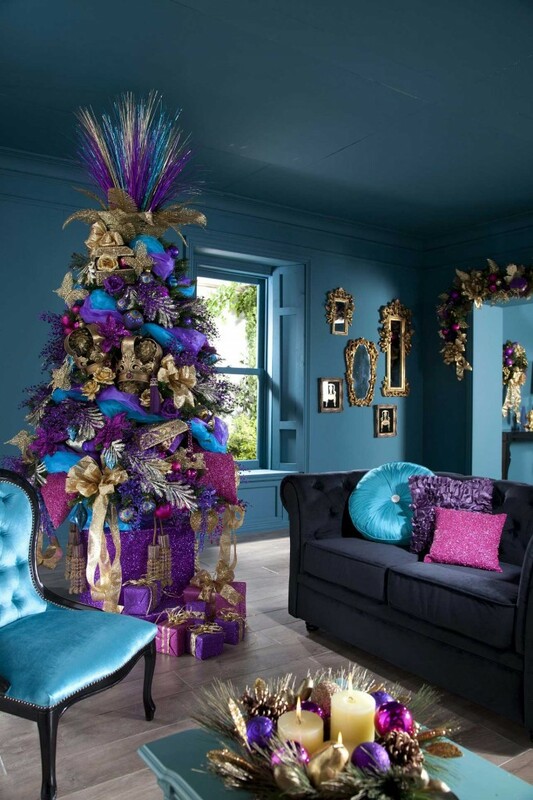 Think fuchsia, teal, quartz purple, amethyst violet, aqua, sapphire blue, emerald green and ruby red.When it comes to jewel-tone Christmas decorations, you can either go for jewel-tone Christmas baubles, huge ribbons, candlesticks or wrapped presents. Here are a few examples of jewel-tone Christmas decoration which I think is super pretty and modern! 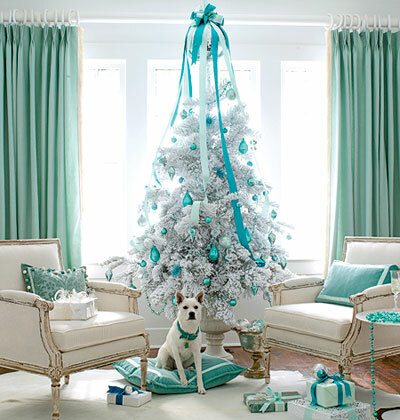 Decorate the cool white Christmas tree with jewel-tone ornaments and huge satin bow in refreshing aqua tone for a more saturated home decor. 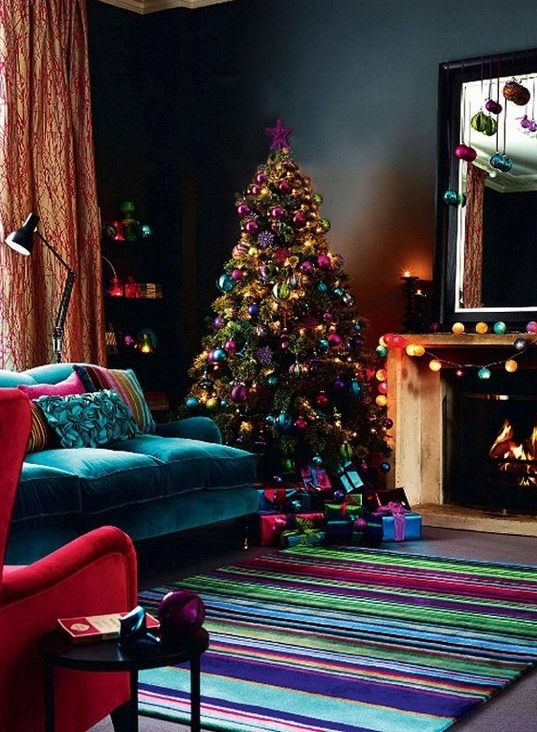 A Christmas tree decorated with vibrant jewel-tone Christmas ornaments and fairy lights, creating a warm and cozy space to kick off Christmas celebration. 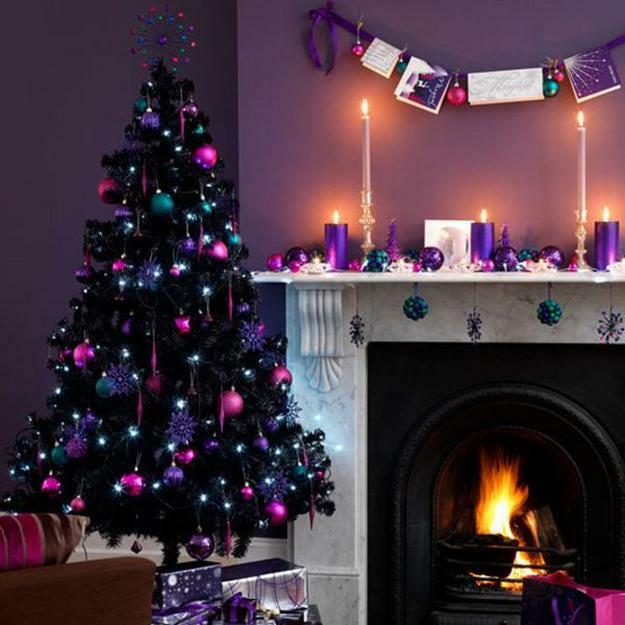 A perfect combination of jewel-tone Christmas decoration which consists of metallic fuchsia, Amethyst violet, and burgundy. Meanwhile, we are loving the reflective violet table lamp and silver cylindrical table that add a touch of metallic glamor to the house. Another vibrant brazil-inspired Christmas decoration that teamed amethyst violet, fuchsia, and aqua colors with a splash of glitter gold. Beautiful jewel-tone Christmas decoration that employs teal, fuchsia, and amethyst violet color for a deep, rich, vibrant interior. If you’d prefer a more grown-up version of Christmas decoration which is less colorful but full of 24K Christmas spirit, then this one is for you! 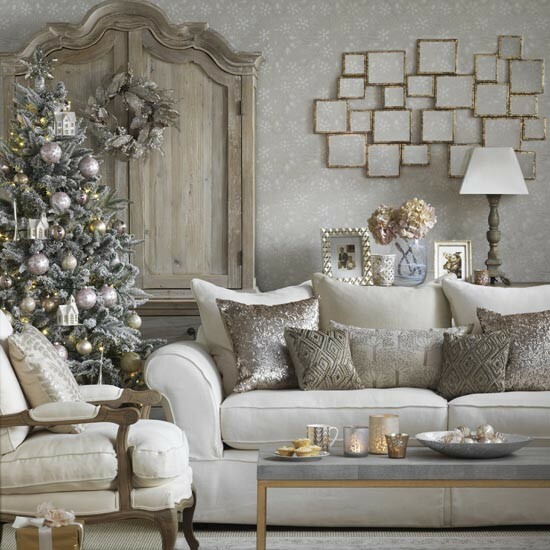 Add a touch of opulent flair to your holiday home with a finite color scheme of silver, gold, and bronze. The easiest way to achieve that metallic accent Christmas decoration is by decorating your snow-frosted tree with silver and gold baubles with a glittery finish. Else, you can pick a corner such as your mantel and decorate it with silver and gold decorations and candlesticks, together with an icy-cool silver wreath on top. Besides, throw pillows are a great way to infuse that metallic accent to your Christmas decoration as well! You just need to opt for a silver sequinned, or silver crushed velvet throw pillows and that’s it! Old but gold, decorate your Christmas tree with metallic gold ornaments and gold wrapped presents underneath the tree. It looks great in a neutral, beige room so that it creates a calm and harmonious space. An ideal silver and chrome Christmas living room adorned with silver silk and sequin throw pillows, reflective hardware, gray rounded mirror, and silver baubles with white fairy lights. The green Christmas tree added a contrast to the metallic accented living space. 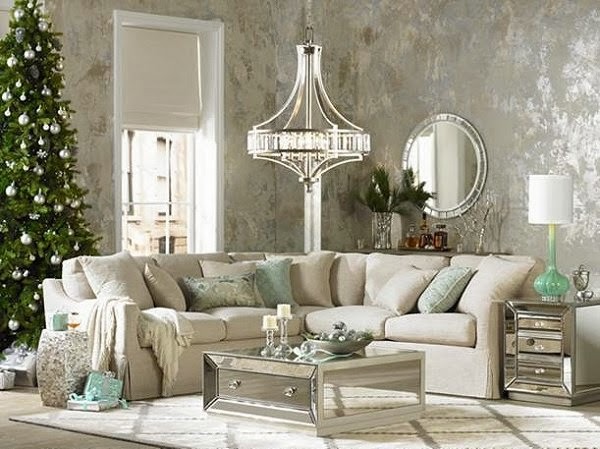 A sparkling metallic Christmas living room which is perfect for kick-starting the festive season with extra glitz. 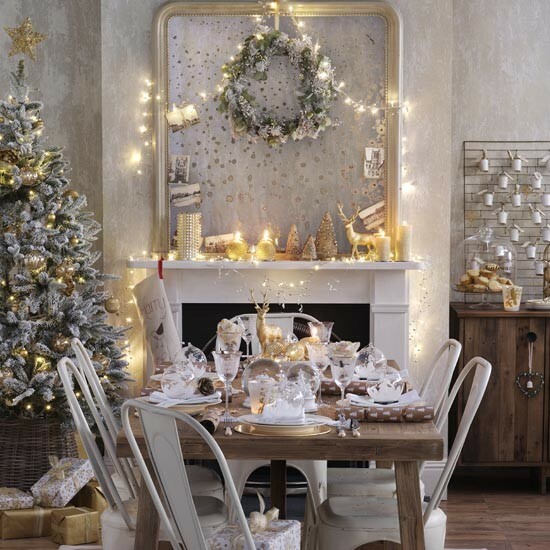 Co-ord the snow-frosted tree with some luminous gold and icy-cool white baubles for a muted, neutral look. Amp up the glitz with sequined throw pillows, while mixing up the metals with some gilded, irregular wall frames. Add some metallic accent to your home interior with a reflective silver coffee table, round reflective mirror and silver hanging lights. 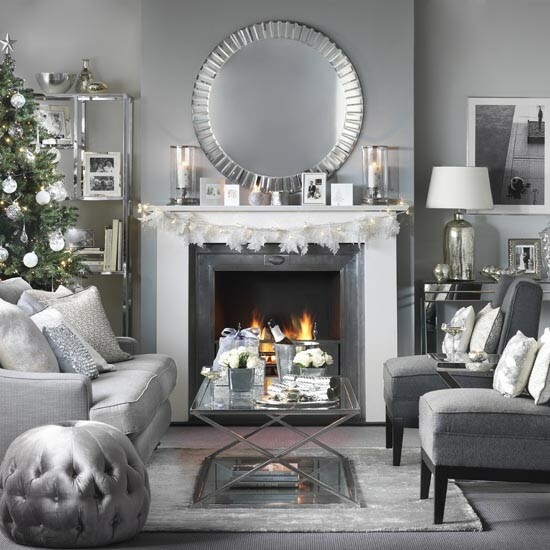 Keep the Christmas tree simple by decorating it with silver and winter-white baubles with matte finishes. Ever dreamt of living in a winter wonderland filled with magical snowmen, snowflakes, and snow-frosted Christmas tree with colorful fairy lights? Transform your home into a fairytale with these winter-inspired elements such as all-white Christmas tree, silver baubles, painted pinecone, and crystal candlesticks. 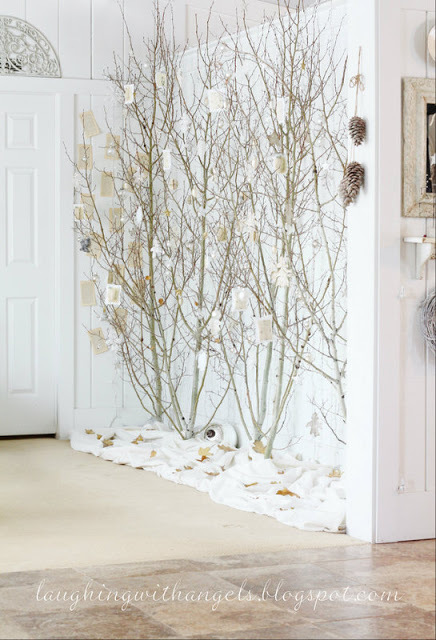 You can also deck your hall with some extra aspens and decorate them with paper snowflakes, crystal ornaments or fairy lights to light up your hall entrance! Don’t have a Christmas tree? Opt for rustic, old wooden chair and paint it white to add some snowy effect. 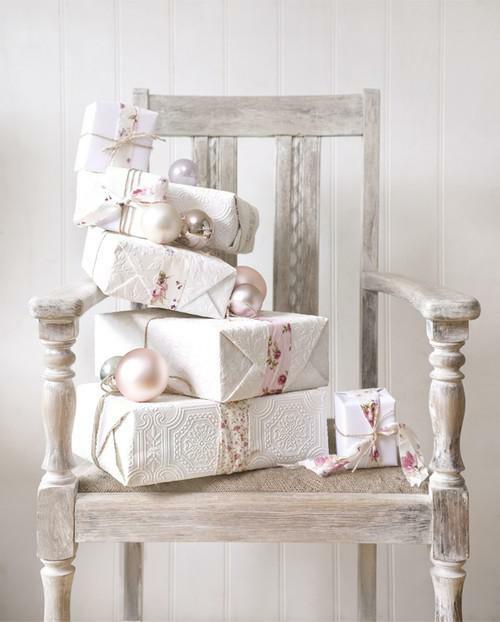 Then, place white presents with some rosy-pink ribbon on the chair for a more festive feel. Decorate it with silver, and pinky-shade baubles to polish up the entire “Christmas chair”. 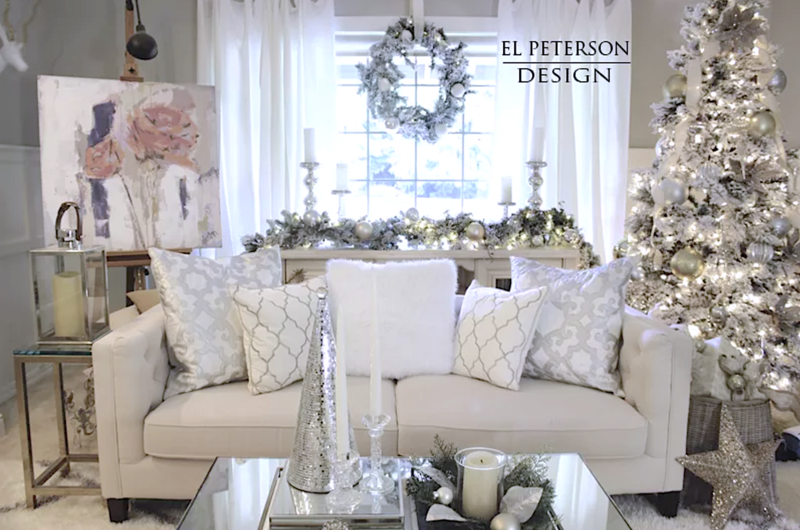 A winter-white living room filled snow-filled Christmas tree, faux fur throw pillows, and metallic silver themed Christmas decor. 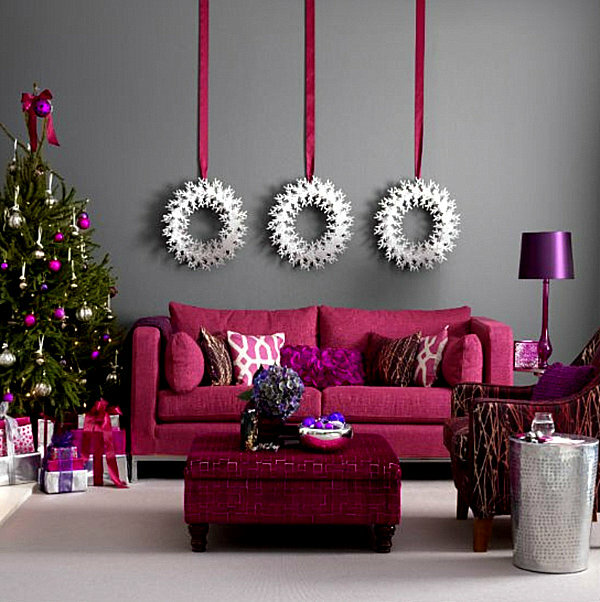 A well coordinated Christmas decoration with white and pink color palette. 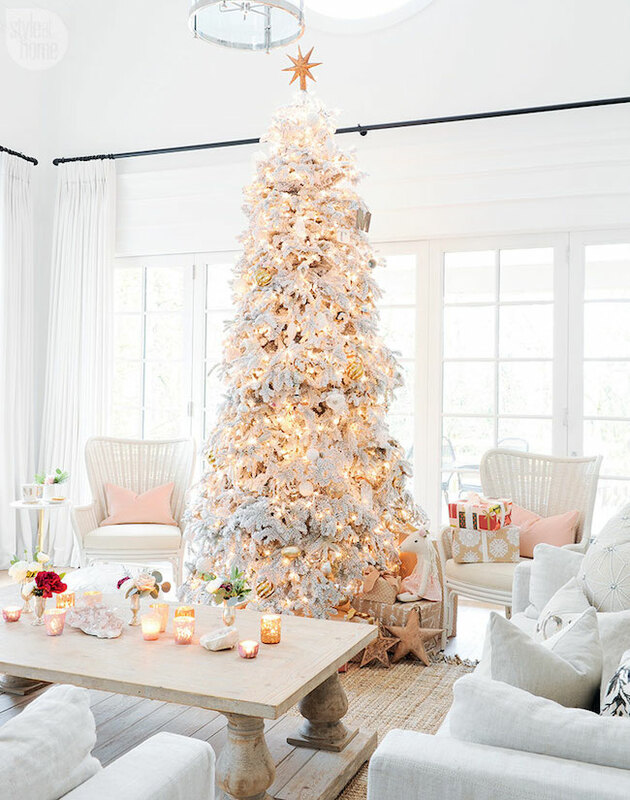 The white Christmas tree looks so put together with yellow fairy lights while the pastel pink throw pillows on the chair just added a chic flare to the room. A simple but stunning way to decorate your entrance hall into a winter wonderland with some aspens covered with winter-white ornaments and fairy lights. Satisfy your inner child with these magical, whimsical and colorful Christmas decoration as if you’re living in the Willy Wonka candy factory! 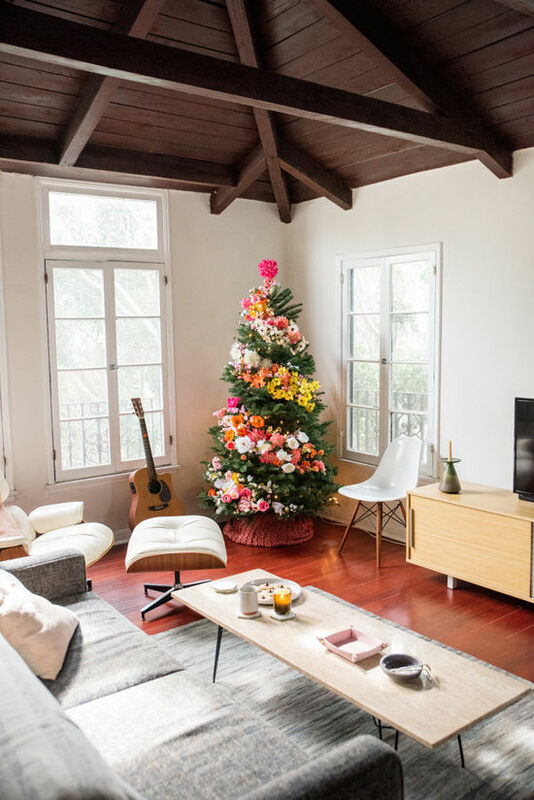 Team your all-white Christmas tree with a spectrum color of sparkling baubles, huge ribbons, and some adorable ornaments to add flairs to your magical home. Of course, you can’t miss out twinkling fairy lights on your Christmas tree or else it wouldn’t be completed. The trick to creating this colorful themed Christmas decoration is to simply have fun and randomly decorate your Christmas tree with wonderful colors! 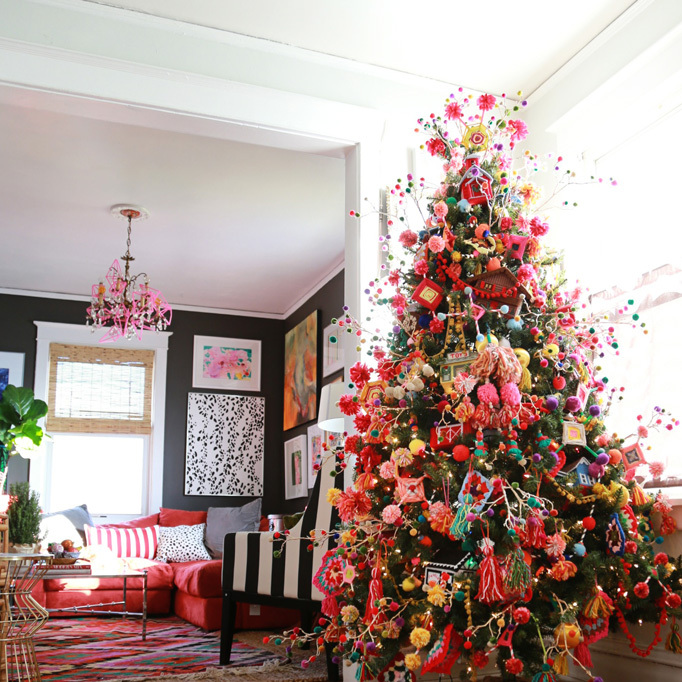 The best way to bring out all the bright, fun colors is teaming an all-white Christmas tree with colorful baubles and ornaments in different patterns and sizes. This magical Christmas tree is sure to bring back all your whimsical childhood memories in no time! 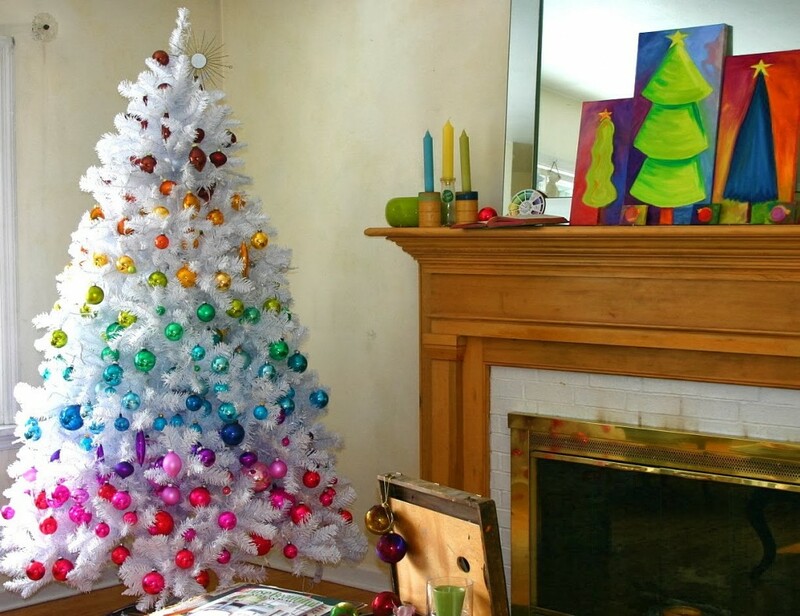 Instead of randomly hanging the colorful baubles on an all-white Christmas tree, why not arrange them in a color spectrum? This rainbow-colored Christmas tree will definitely bring all the great satisfaction to OCD people. 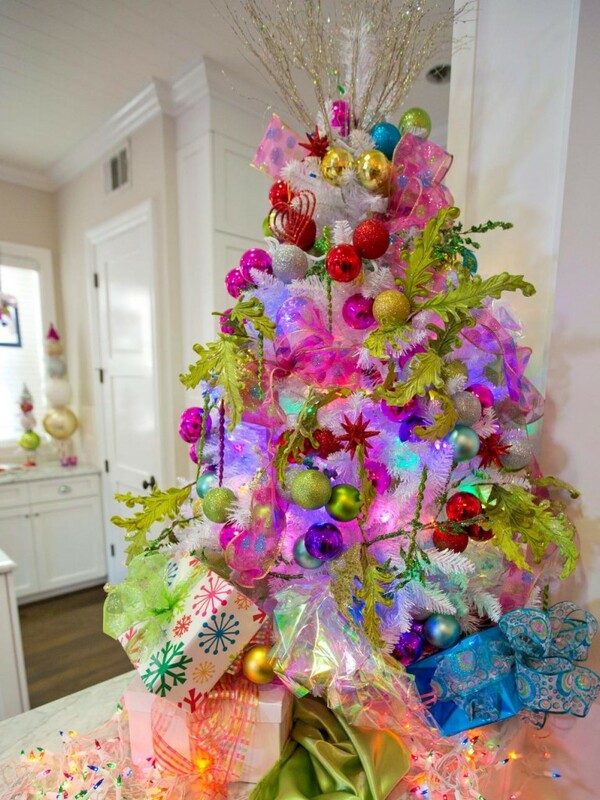 Another color-bursting Christmas tree decorated with all the glittery and shimmery baubles. It looks perfectly stand out in a beige/neutral space. 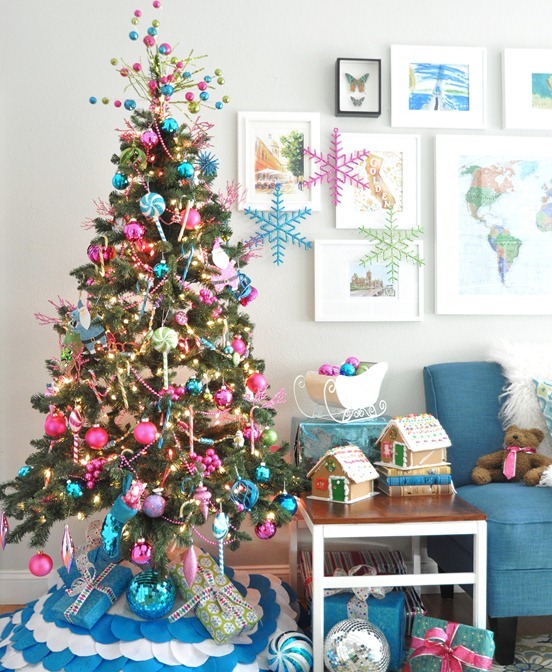 Opt for candy-colored Christmas ornaments and fairy lights to decorate your Christmas tree! It will bring cheer and liveliness to your space with a medley of multi-colored decorations. There are so many ways to add a touch of Boho panache to your home this holiday season. For example, some bright colored candle sticks to brighten up your mantels, an exotic Christmas tree decorated with handmade ornaments, a floral Christmas tree and a colorful pom-pom decorated Christmas home. These groupings will be sure to add a flamboyant touch of Christmas spirit to your home with a wide spectrum of bright colors, outlandish textures, and patterns which are so different from any traditional Christmas decoration! 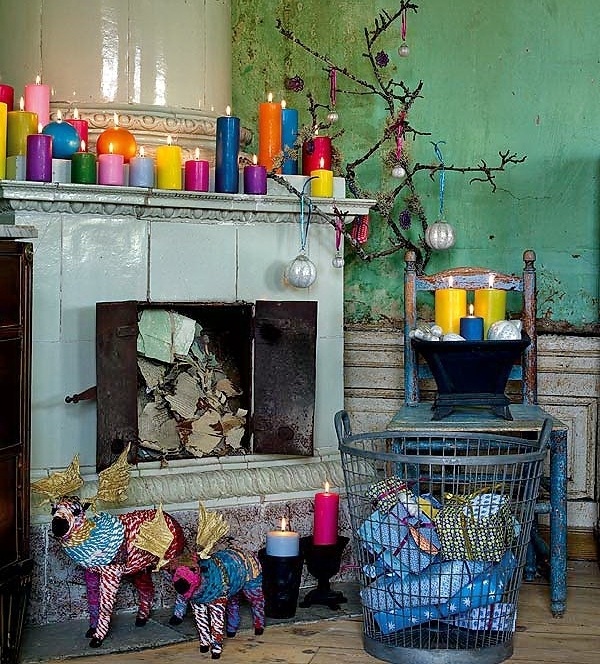 Decorate the mantle with bright color candles for a bohemian-inspired holiday decor. Use a simple branch as a Christmas tree and decorate it with silver ornaments and colorful ribbons. Throw presents into a rustic oil-rubbed basket for a rustic feeling. 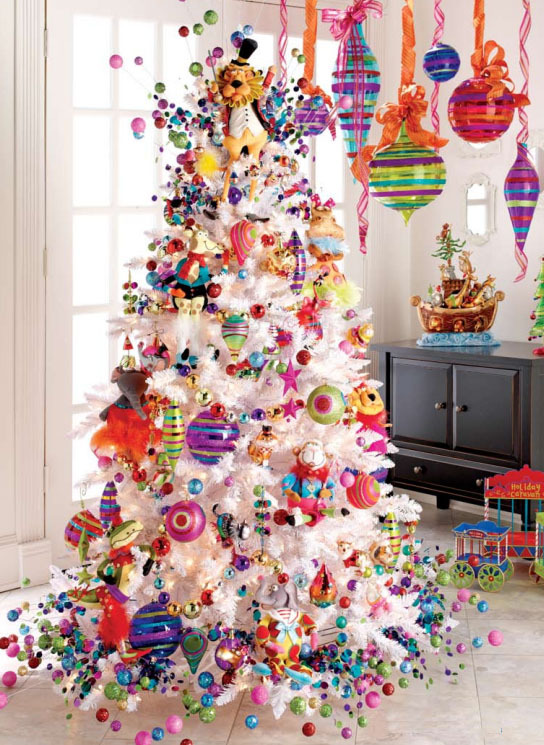 An exotic, one-of-a-kind Christmas tree which is decorated with a wholesome of handmade ornaments. Take this as an inspiration and channel your inner granny chic in a beautiful boho-style this Christmas! Like any Bohemian style, it can’t go without dreamy flowers! Instead of going for sparkling colors baubles or ornaments, try decorating the Christmas tree with a mix of cream, white, yellow and pink flowers together with fairy lights. Forget about those traditional green and red Christmas ornaments because these pom-pom garlands can add a great touch of Christmas flair to your space too! 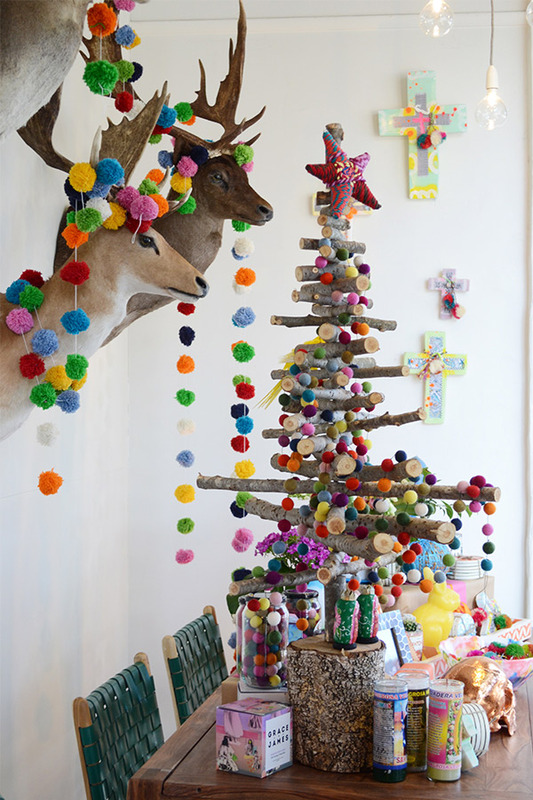 Hang it on a stacked wood branches that resemble a Christmas tree for a festive holiday look! Celebrate the festive season with some classic wood flooring, burlaps textures, deep rich natural green elements and some traditional red decorations that will fill your holiday home with an old-world glamor. Add natural beauty to your holiday decorations with a fresh green wreath, an aspen branch decorated with some classic Christmas ornaments and twinkling fairy lights, a huge natural Christmas tree decorated with classic red baubles and fairy lights, and a fireplace decorated with a wood chalkboard and burlaps stockings. This rustic Christmas decoration is a great escapism for people who are constantly living in the technological world and want to get rid of digital distractions this coming holiday season. 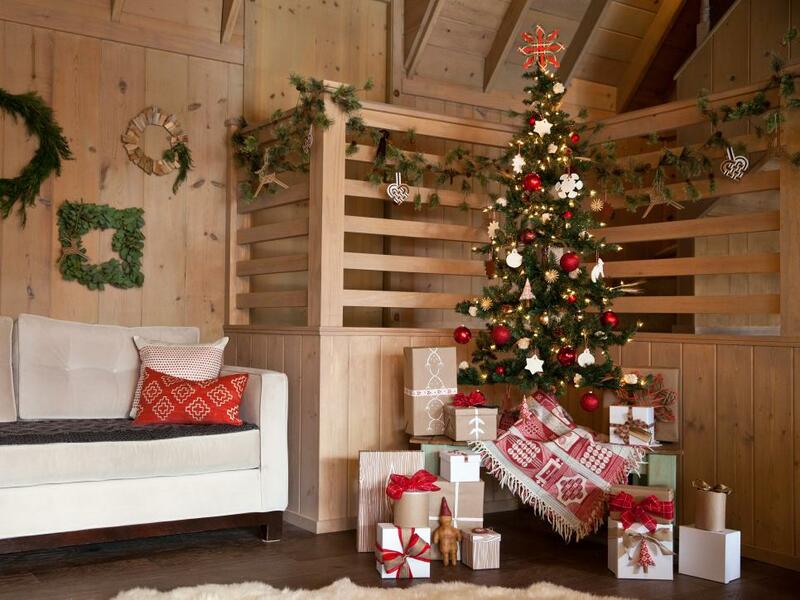 A rustic living home with wooden walls and flooring decorated with a traditional Christmas tree and natural garlands. 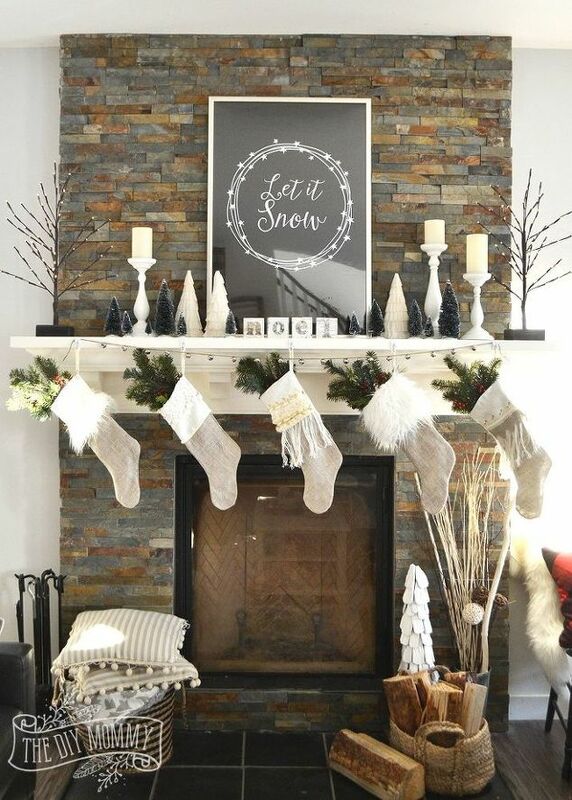 Rustic mantel Christmas decoration with old wooden board, white chalk typography, and neutral baubles. Give your mantel a rustic, festive feeling with white candlesticks, a white-framed typography, and a small wooden branch with fairy lights. 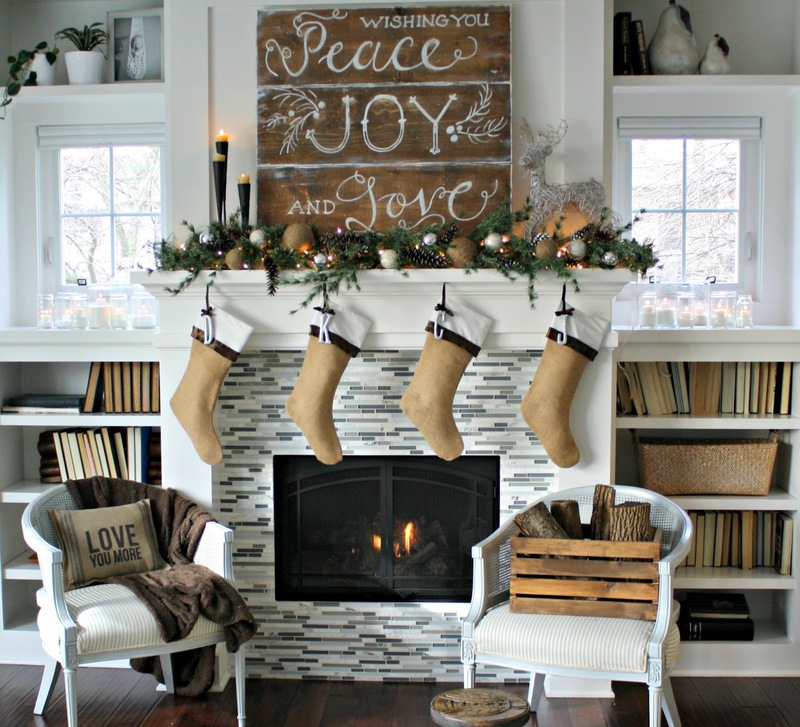 Add a Christmas touch with a few burlap Christmas stockings for extra rustic vibes. 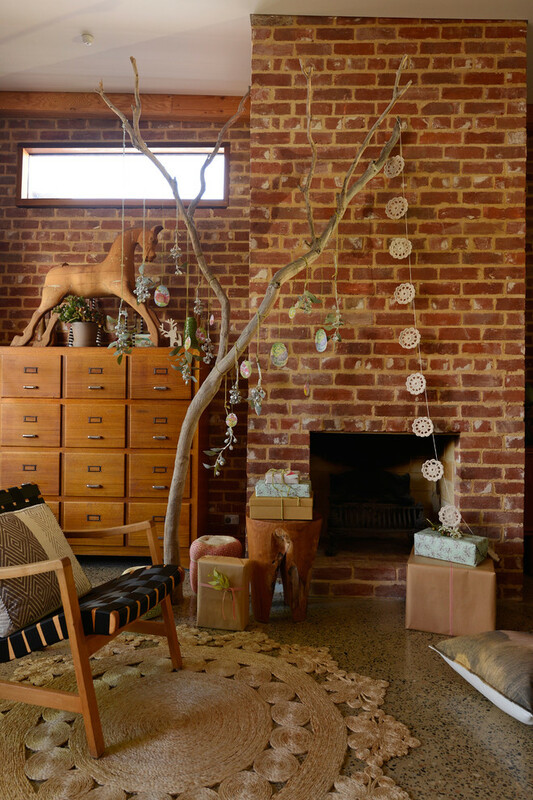 A beautiful rustic country house living room decorated with a simple old wooden branch, paper cut garland and some simple gift-wrapped presents on the ground. That’s it for today’s topic and I hope you guys have gained some inspiration for your Christmas decoration! 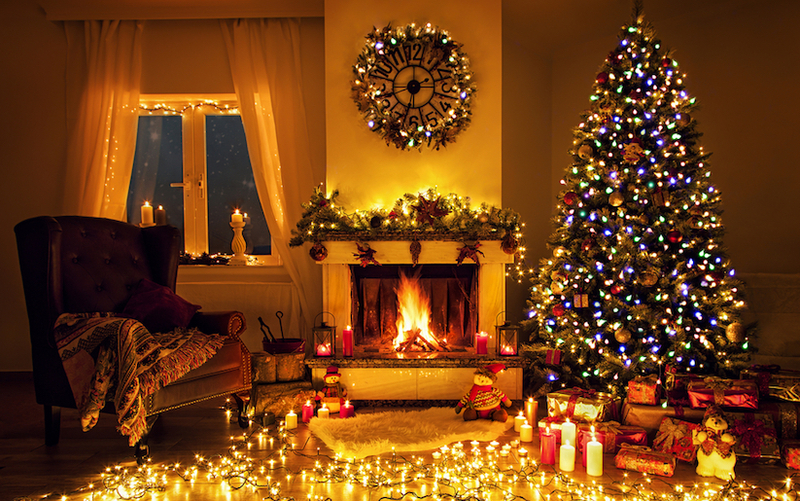 Out of these six special themed Christmas decoration, which is your favorite? 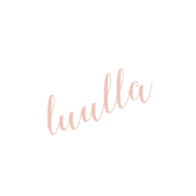 Stay tuned for more inspirational topics from us as we update on every Monday, Wednesday, Friday and Saturday. Till next time and don’t forget to be awesome today!